Hanson designs and manufactures vintage style electric guitar and bass pickups and electronics. Our products are hand made in Chicago by builders dedicated to the concept of pickup design as an art. By keeping our production runs small, we are able to lavish attention to detail and quality. These custom wound pickups are a perfect fit replacement for some of the most popular bass/guitar models in the world. Hanson is also in the business of original design. Working in conjunction with Lakland Bass Guitars in Chicago, Hanson developed the Lakland/Hanson LH3 active pickup system. 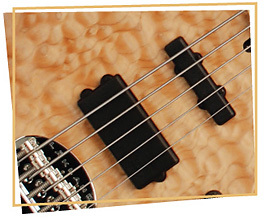 In designing the LH3 system, Hanson utilized Lakland’s access to the ears of the best bass players and builders in the world. The LH3 system has received glowing reviews from Bass Player magazine, as well as from top bass players everywhere. The LH3 preamp is now available to anyone who wants to upgrade their active system. Hanson is becoming a market leader in the use of powerful neodymium magnets in new pickup designs. The newly launched neodymium driven Lakland/Hanson Chi-Sonic series features a dynamic new direction for the sound of bass guitar.